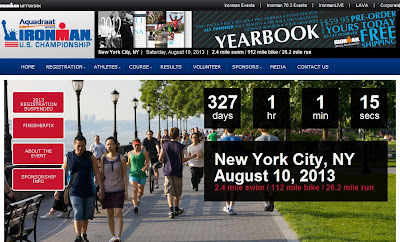 Nach rund acht Jahren Planung und einem Probelauf im Jahr 2012 beendet die World Triathlon Corporation (WTC) das Experiment Ironman New York City. Begründet wird der Rückzug nach nur einem Jahr mit hohen logistischen Hürden. Exemplarisch nennt die WTC schwer zugängliche Streckenabschnitte für die Zuschauer, eine komplexe Teilnehmerlogistik mit Übersetzen der Triathletinnen und Triathleten mit einer Fähre und last but not least die insgesamt sehr hohen Kosten für Dienstleistungen aller Art, die ein Triathlon in einer Metropolregion wie New York City benötigt. For 34 years, IRONMAN has remained committed to delivering worldclass event experiences for athletes around the globe. By suspending registration for the 2013 Aquadraat Sports IRONMAN U.S. Championship, we were able to take the time to thoroughly review all aspects of the event. Our conclusion: this race cannot be conducted in the way our athletes expect and deserve. After carefully considering feedback from athletes, spectators, partners, volunteers and our host communities, IRONMAN has decided to cancel the Aquadraat Sports IRONMAN U.S. Championship. Producing an event in a large urban market is complex and challenging. The combination of the ferries, transition in Palisades Interstate Park, and the difficulty for our spectators to watch much of the inaugural race all combined to create an experience that needed substantial improvement. Also, the inability to have amplified sound in Riverside Park after 10 p.m. does not allow us to offer the IRONMAN finish line experience our athletes love. Celebrating each athlete’s accomplishment by announcing the coveted words: “You are an IRONMAN,” is a unique and important part of our races. The resources needed to reconfigure a number of elements, as well as properly address the logistical complexity and operational challenges of this particular race aren’t realistic. An important part of our commitment to the IRONMAN experience is the relationship between registration price and the value to athletes. We cannot uphold this commitment while producing the caliber of race our athletes deserve. Creating once-in-a-lifetime experiences for athletes, spectators, partners and volunteers is our priority. We continue to be amazed by our athletes and all of those involved in the success of our events, and we congratulate everyone, especially the more than 4,000 volunteers, who made the 2012 Aquadraat Sports IRONMAN U.S. Championship a memorable day in IRONMAN’s history. We hope each of you will continue your IRONMAN journey and be a part of another event in the IRONMAN Series.